Let survey the elements of Clojure constructs. Each programming construct is actually a fragment of Clojure’s data descriptive language. We will refer to this extended s-expression syntax also as s-expressions. 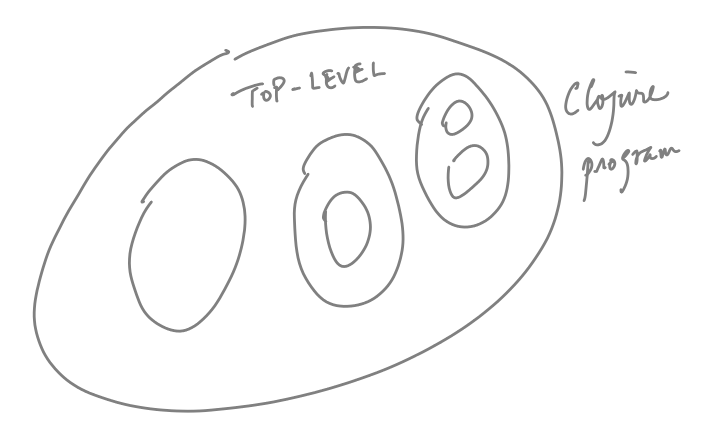 Clojure programs start with a top level. Actually, later on, we will see that Clojure program can (and usually do) have multiple top-level scopes associated with different namespaces. Symbols can be defined at the top-level using the form. :note "CSCI 2000U is a new course"
Top-level symbol bindings are discouraged except for top-level functions. When a new scope is created? What are the bindings created in the new scope? Functions are also data, and you construct a function-value using the (fn [...] ...) form. Here is a function-value that is declared, but not bound to any symbol. In side the fn form, we have four symbols. Note that there is no bindings for a, b nor c because these bindings will be created only when the function is applied to given arguments. We can bind the function to a symbol so it can be used repeatedly.